By my usual standards, a Halloween cocktail is really just a fall cocktail. I tend to think of cocktails fitting into a season or mood, not an occasion. So a Christmas cocktail is a winter cocktail, a birthday cocktail depends on when your birthday is (or, if you're me, it's just a glass of whiskey). But when it comes to Halloween, clearly I'm in the minority. For most people, a Halloween cocktail is a category entirely its own. As long as it tastes like candy and looks like something gruesome - i.e. blood red with eye balls floating in it - it's good to go. It's named after the infamous, heavily polluted and heavily fragrant Canal that runs through Brooklyn (it's also rumored to be a Mafia dumping ground). Like the canal, this punch is ugly, murky and if you believe the rumors, has a dismembered hand floating in it. Unlike the canal, it is refreshing and delicious. It's also quite light, so you can indulge in more than a few servings. Gowanus Canal Punch - makes about 20 servings. 1 liter aloe juice - Not all natural aloe juice. The aloe juice drink that usually comes in a green bottle. Preferably with pulp. For best results chill the aloe juice and spirit beforehand, ideally with the spirit in the freezer. Muddle the basil leaves in the simple syrup, tearing them a bit. Usually I advise against tearing up herbs when muddling, but in this case, go for it, the uglier the better. 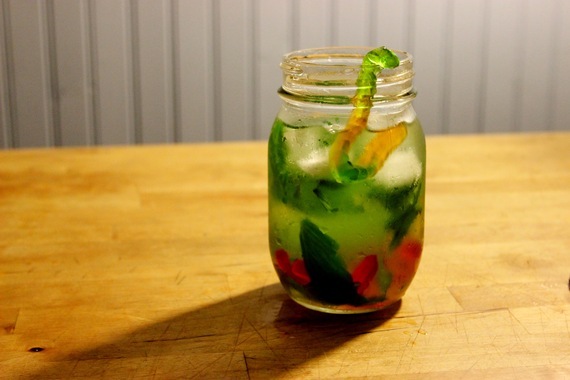 If you have time, let the muddled basil and simple syrup sit for 10-15 minutes. This will extract more flavor and green color. Add all ingredients to the punch bowl, including the basil, and briefly stir to combine. Add a hand-shaped ice cube - or a regular boring ice cube. To serve, pour into glasses over ice and Gummi worms - or any Gummi critters you desire. Fill a rubber glove with water up to just below the wrist portion. Use something non-toxic (of course) with no lining or powder. Twist the end of the glove to make a closure and tie a double knot around it with cooking twine. To remove the glove, run knot end under cold water. Not the entire the hand, or it could crack. The ice inside will begin to melt so you can pull the knot away from the ice and cut it off (if it wasn't obvious already, you are going to have to sacrifice this glove to the Halloween demons). Gently peel the glove off the ice, you may have to cut and shimmy it here and there, but it should come fairly easily. Of course, you don't need to make this punch to use these little tricks. 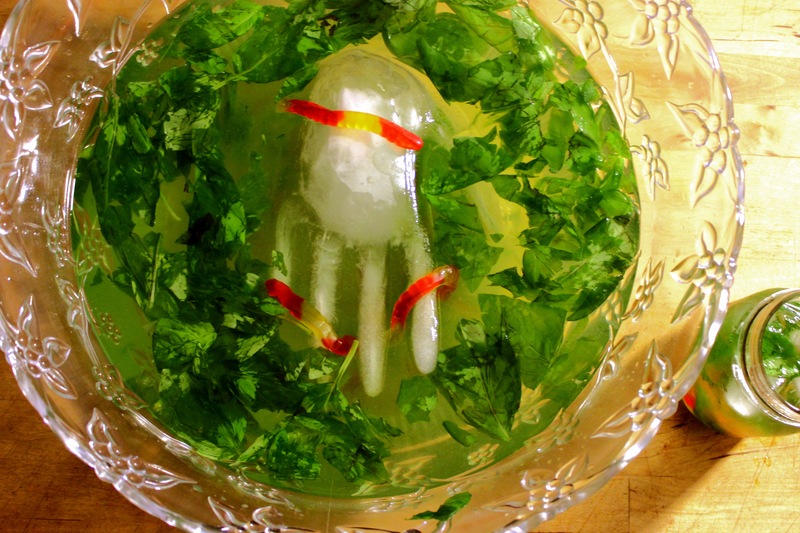 Any cocktail you wish can have an ice cube shaped like a hand floating in it or Gummi worms as a garnish. If you do use food coloring, it's best to mix with white spirits. Brown ones won't be as cooperative. Have a kitschy, spooky and fun Halloween everyone! Cheers!